On 31 January 1946, the Unites States Army Air Force issued a Request for Proposal involving the design of a heavy-lift helicopter capable of transporting a 10,000 lb (4,536 kg) external load. Additional specifications include the use of jet turbine propulsion and rotors equipped with tip jets. 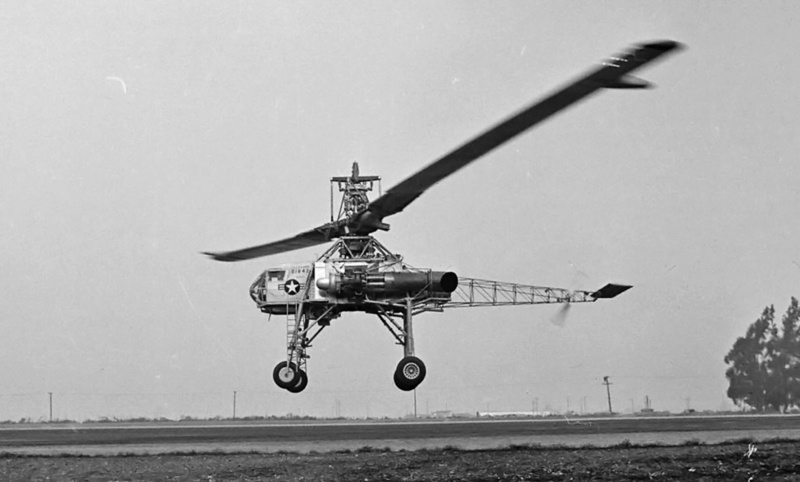 The Kellett Aircraft Corporation of Upper Derby, Pennsylvania was awarded a design contract on 2 May 1946, and the new helicopter was designated XR-17. If all went well with the XR-17’s design, a contract to build a test rig would be issued. Kellett moved forward with the XR-17 design, which was centered around a pair of 4,000 lbf (17.79 kN) General Electric J35 (TG-180) engines driving a two-blade rotor. However, the engines were not mechanically attached to the rotors. Air was bled off from the compressor section of the modified engines and was ducted through the hollow rotors. The 400°F (204°C) air was exhausted from each rotor via four pressure-jets in the tip’s trailing edge. The jet of air emanating from the rotor tips caused the rotors to turn. This propulsion system was referred to as cold-cycle pressure-jet, because the air from the engine’s compressor section was much cooler than the air from the engine’s exhaust. To further augment power, General Electric GE33F pressure-jet burners sprayed and ignited fuel into the jet of air exiting the rotor. Kellett estimated that 1,000 hp (746 kW) was produced with the cold-cycle air jet alone, and 3,480 hp (2,595 kW) was produced with the tip burners in use. 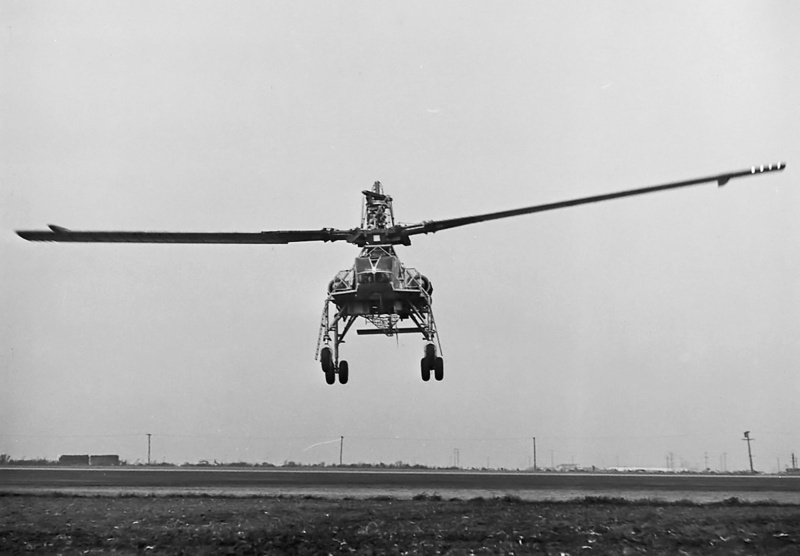 By 27 August 1947, the XR-17 design had progressed well, and Kellett was awarded a contract to produce a test rig of the helicopter’s rotor system. Kellett went to work constructing the test rig and tried to save money wherever possible by using components of other aircraft. The company was having financial issues, and the XR-17 project had an uncertain future. In June 1948, the helicopter was redesignated XH-17. Through 1948, work continued on the XH-17 test rig, but the financial issues at Kellett only worsened. With the Air Force’s blessing, Hughes Aircraft purchased the XH-17 project and moved all materials and many Kellett personnel to Culver City, California. Work on the XH-17 resumed in March 1949 and progressed rapidly with full support from Hughes. The Hughes XH-17 consisted of a cockpit from a Waco CG-15 glider attached to a custom-built tube steel frame. Its steerable front landing gear was made using the main wheels from a North American B-25 Mitchell, and its rear landing gear was made using the main wheels from a Douglas C-54 Skymaster. The XH-17’s fuel tank was originally a 636-gallon (2,408-L) extended-range bomb bay tank for a Boeing B-29 Superfortress. The helicopter’s 130 ft (39.62 m) two-blade main rotor turned at 88 rpm. Each blade was 12 in (.30 m) thick, 58 in (1.47 m) wide, and weighed 5,000 lb (2,268 kg). The large pressure-jet rotors had a very short fatigue life. 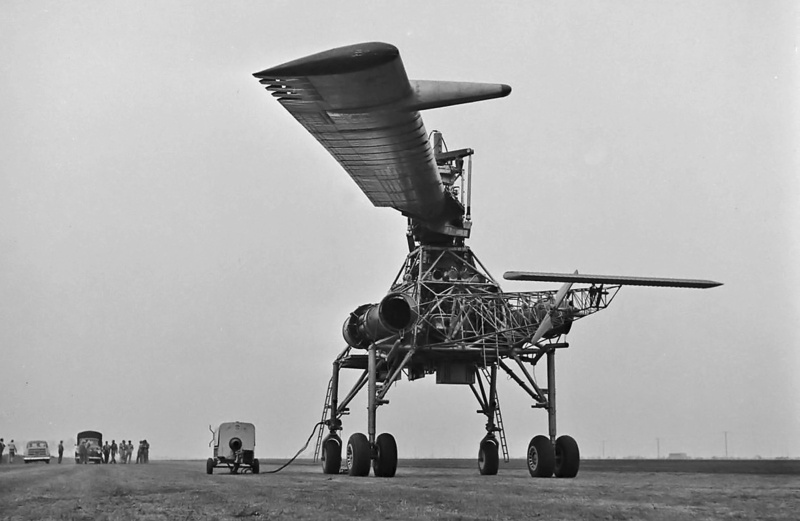 The XH-17 test rig was run for the first time around October 1949. Only bleed air was used to turn the rotors. After about three months of testing, the rotor burners were fired for the first time on 22 December 1949. This created a very a loud whop-whop-whop noise that coincided with the passing of each set of lit burners on the rotors’ tips. The noise was so loud that it could be heard eight miles (13 km) away, and the XH-17 caused numerous noise complaints to be filed against Hughes. 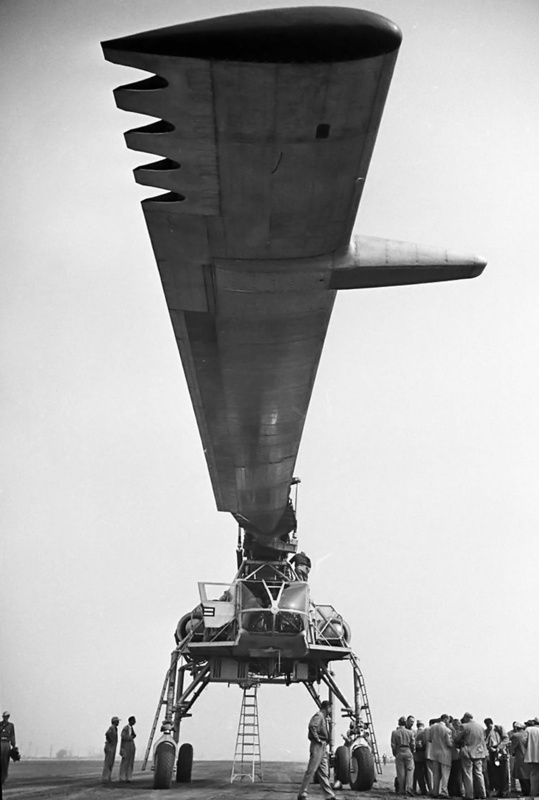 Testing of the rig steadily progressed until June 1950, when a control link broke and caused the XH-17 test rig to rise about 10 feet (3 m) off the ground before it crashed back down. The rig was damaged, but the rotors and power system were unharmed. Rather than just rebuild the test rig, the decision had already been made to convert the rig into a flight-capable helicopter. Numerous systems were revised, and a tail rotor from a Sikorsky H-19 Chickasaw was added. The tail rotor was small compared to the rest of the XH-17. The rotor jets did not create a major torque reaction that needed to be counteracted like the main rotors of a conventional helicopter. The tail rotor was mainly for differential directional control. The wide-set and tall landing gear allowed loads to be driven under the helicopter and then attached for lifting. The XH-17 was ready for flight in the summer of 1952. The complete helicopter was 53 ft 4 in (16.55 m) long and 30 ft 2 in (9.17 m) tall. The XH-17 had an estimated top speed of 90 mph (145 km/h) and a range of only 40 miles (64 km), due to the high fuel consumption of the rotor’s pressure-jet burner system. The helicopter had a normal weight of around 41,700 lb (18,915 kg) and a maximum weight with a 10,284 lb (4,665 kg) payload of 52,000 lb (23,587 kg). As the XH-17 program was progressing, the Air Force asked Hughes to design an improved and more powerful version in October 1951. The new helicopter was designated XH-28 and would use a cold-cycle rotor system with pressure-jet burners, similar to the arrangement on the XH-17 but with four blades. Power was provided by two Allison XT40-A-8 turboprop engines. Each 5,300 hp (3,952 kW) XT40 engine consisted of two T38 engines coupled to a common gear reduction. The engines in the XH-28 would drive a compressor unit to send air to the rotors. 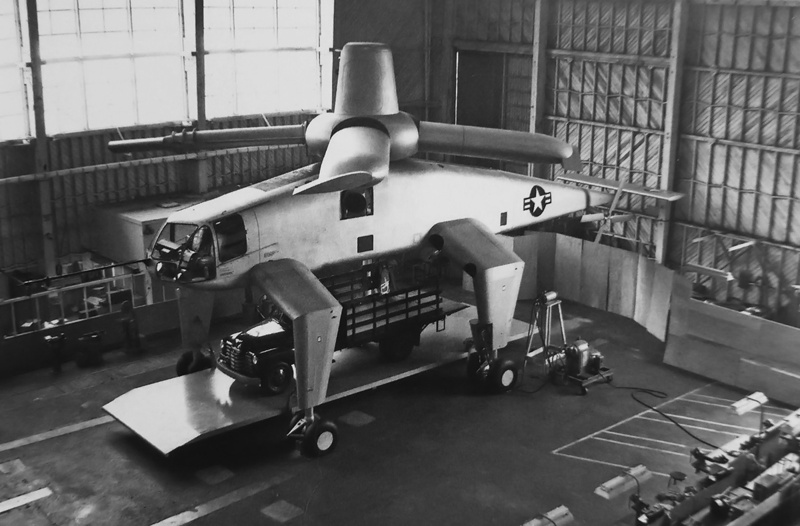 The XH-28 would weigh 52,000 lb (23,587 kg) empty and would be capable of lifting 50,000 lb (22,680 kg), for a total gross weight of 105,000 lb (47,627 kg). The Air Force awarded a design contract for the XH-28 to Hughes in January 1952. A XH-28 mockup was constructed, and extensive testing was involved to create rotors with an extended fatigue life. Ultimately, rotors of a bonded titanium construction were chosen. Allison was hesitant to devote engineering resources to the engine design because the company was involved with so many other projects that it felt held more promise. In December 1952, the Air Force decided that its funds should be spent on jet fighters and bombers and that it would not support the XH-28 beyond 1953. The Air Force was willing to hand the project over to the Army, which was interested in the XH-28 as a way to transport tanks and other equipment. However, the Army soon decided that its funds would be better spent on smaller and less expensive helicopters and never took over the XH-28 project. On 17 August 1953, the Air Force cancelled the XH-17 and XH-28. XH-17 flight testing progressed sporadically over three years. Later flights pushed the helicopter’s speed up to 70 mph (113 km/h) and altitude to 350 ft (107 m). The XH-17 made 33 flights for a total of 10 hours flying time. 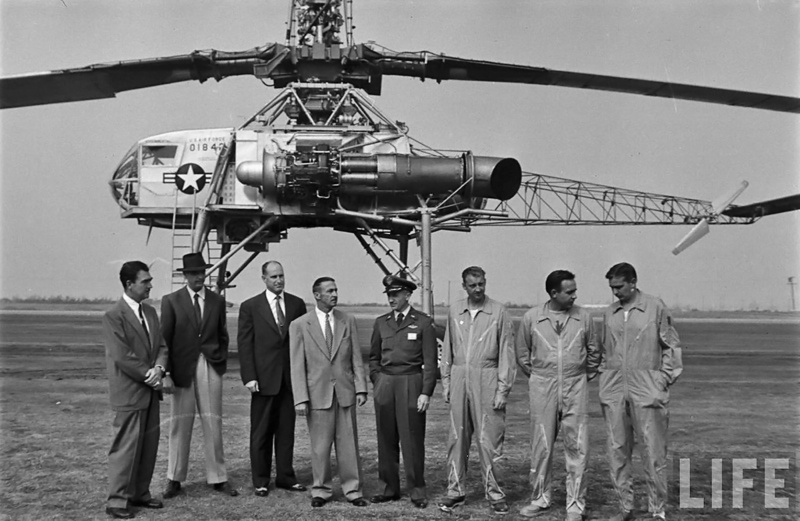 Flight tests were halted in December 1955 on account of the rotor blades reaching their fatigue life. On the XH-17’s last flight, the helicopter carried an 8,000 lb (3,629 kg) communication trailer, which pushed the XH-17’s gross weight to over 50,000 lb (22,680 kg) for the flight. 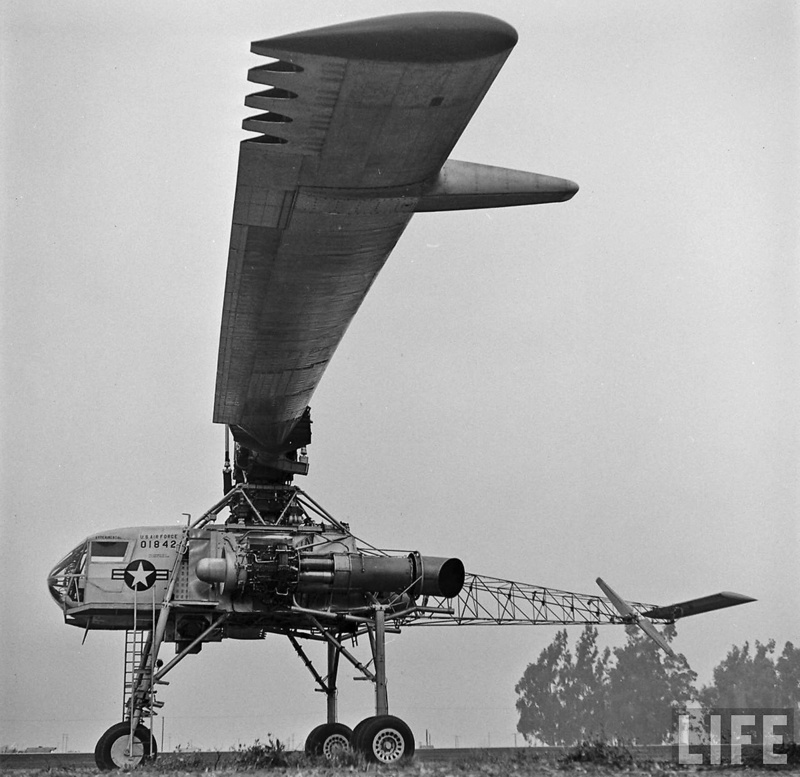 At the time, the XH-17 was the world’s largest helicopter and could carry more than any other helicopter. Its 130 ft (39.62 m) rotor system is still the largest ever used. However, the XH-17’s noisy operation and short range limited its usefulness. The XH-17 and the XH-28 mockup and parts were eventually scrapped. This entry was posted in Rotorcraft on 20 November 2018 by William Pearce. Absolutely wonderful synopsis. Thank you. The propulsion system seems to be very similar to the modern canard rotor wing concept. Interesting to see an earlier version originating from the 40’s.